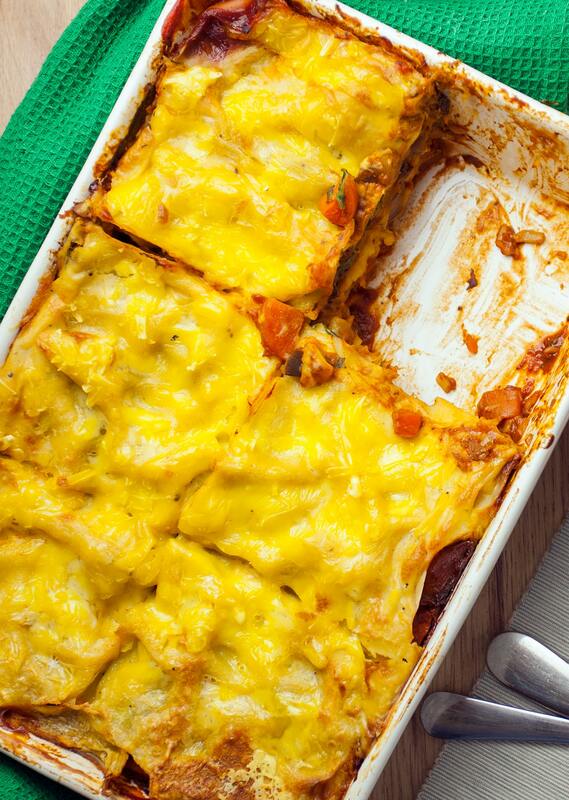 Can you believe it has been this long since we shared a lasagne recipe? Well at least the wait was worth it. 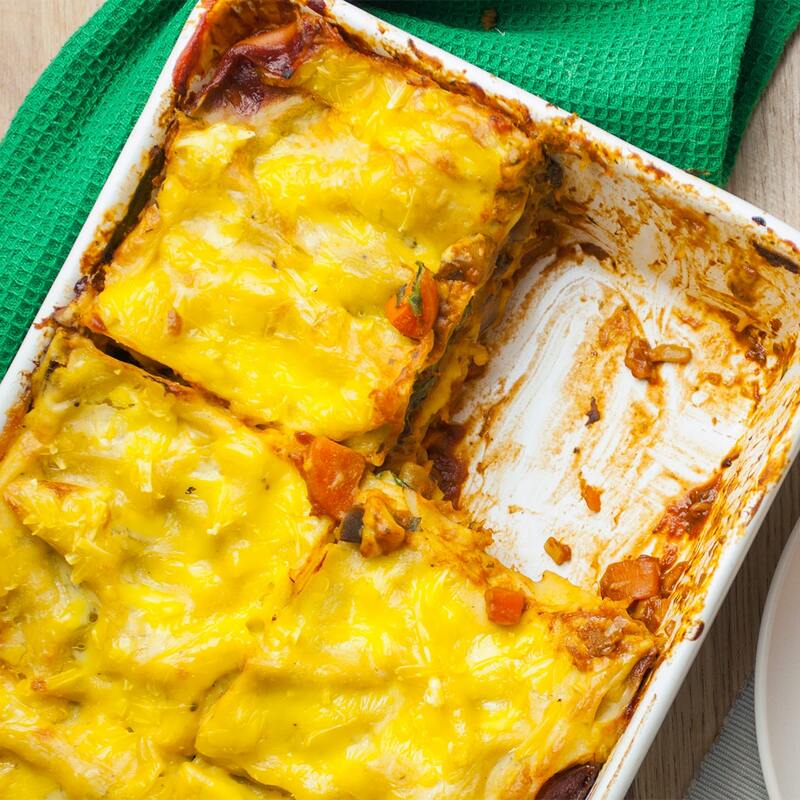 This lasagne has been a staple during these cold winter months. It’s super simple and packed with tons of flavour. You can find vegan pesto in most supermarkets, but we recommend making your own if you haven’t tried before. Here’s our go-to homemade pesto recipe in case you want to give it a go. Preheat the oven to 200°C or 390°F. Heat a little oil in a saucepan and fry the aubergine, mushroom and carrots for 10 minutes. Add the onion and garlic, and fry for a further 5 minutes. Stir in the passata, balsamic vinegar, salt, pepper, and sugar, and simmer for 10 minutes or until most of the water has evaporated. Then remove the pan from the heat and set to one side. To make the Béchamel sauce, melt the vegan margarine in a saucepan. Once melted, add the flour and stir until combined. Gradually stir in the soya milk a cup at a time. Let the sauce simmer for 10 minutes or until it has thickened up, stirring continuously to get rid of any lumps. If you still have lumps, stir with a whisk. Add the nutritional yeast, nutmeg, and a pinch of salt and pepper. Stir until the ingredients have combined and the sauce is smooth. Once ready, remove the Béchamel sauce from the heat and set to one side. If the Béchamel sauce thickens too much once it's off the heat, whisk in a little extra soya milk. To make the lasagne, cover the bottom of the baking dish with 1/3 of the vegetable sauce. Then cover with 4 lasagna sheets, another 1/3 of vegetable sauce, a handful of spinach leaves and finally a layer of Béchamel sauce. For the next layer, cover the Béchamel sauce with another 4 lasagne sheets, cover with pesto, then add the last 1/3 of vegetable sauce, another handful of spinach, and a 1/3 of the Béchamel sauce. For the last layer, cover the Béchamel sauce with 4 lasagne sheets, then pour over the remaining Béchamel sauce and finally sprinkle vegan cheese over the top. Cover the lasagne with foil and bake for 30 minutes. Then remove the foil and cook for 20 minutes uncovered. Which vegan cheese did you use? Hey Clara. We use the Violife ‘cheddar’ cheese. Thanks! Hey, can I swap the soy milk for almond milk? Hey Naama. Yep, you can substitute the soy milk with any other dairy-free milk. Thanks! I made this last night but couldn’t find nutritional yeast in the shop so I melted half of the vegan cheese into the sauce. 100% making this again, it was absolutely amazing.